Dimension: Avoid swelling or shrinking and thus the dimension always remains stable. 1) Free from infilling rubber granules . 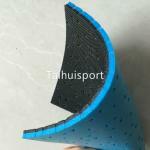 2) Enhance the elasticity of court, reduce the injury risk of the athletes. 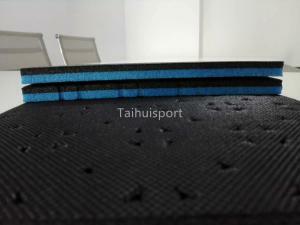 4) Improve the water permeability, will not affect the performance after rainfall. Diamond-shaped structure on the surface increases the coefficient of friction, and hard for pad to slide after covering the artificial grass. Looking forward to provide quality product and support for your project.